After reading the history-based critique below, it’s hard to believe the King James version of the bible could possibly be the word of God. It’s this kind of historical tracing (which I first learned about in a Hellenistic Religions class in college) that began the erosion of my Catholic faith. The King James version of the New Testament was completed in 1611 by 8 members of the Church of England. There were (and still are) no original texts to translate. The oldest manuscripts we have were written down hundreds of years after the last apostle died. There are over 8,000 of these old manuscripts, with no two alike. 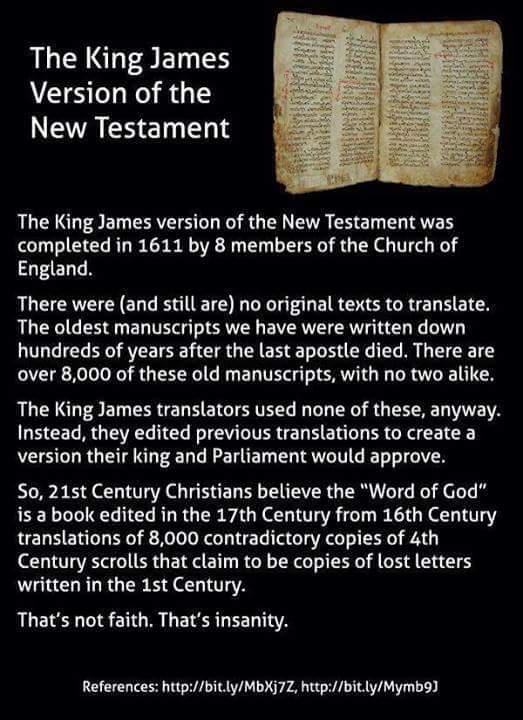 So, 21st Century Christians believe “the word of God” is a book edited in the 17th Century from 16th Century translations of 8,000 contradictory copies of 4th Century scrolls that claim to be copies of lost letters written in the 1st Century.